The barrier block is an invisible indestructible block used to create impenetrable boundaries, only obtainable in creative mode. Barriers cannot be broken by any means in survival mode. However, they can be obtained through the /give command and through the creative inventory. Barrier blocks are a good way to make invisible walls in custom maps to prevent players going anywhere that is not intended to be accessible, without there being a visible barrier like with bedrock. 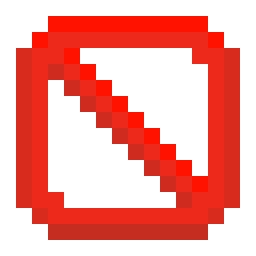 It does not allow the player or any other entities through, so it can keep them inside a space where they are meant to stay. If the player is holding a barrier block in their hand slot, barrier blocks on the screen change from invisible to the texture of the barrier, as seen in the inventory. Like to regular solid blocks, fence, fence gate, and iron bars connect to barriers. Blocks that require a supporting block like carpet or minecart rails can be placed on barriers. Snow can form on barriers when it is snowing. Barriers, like bedrock, cannot be moved by pistons or sticky pistons. There are currently no reported bugs with barriers. Player holding a barrier, showing other barriers in the world. Same barriers hidden due to player not holding a barrier.